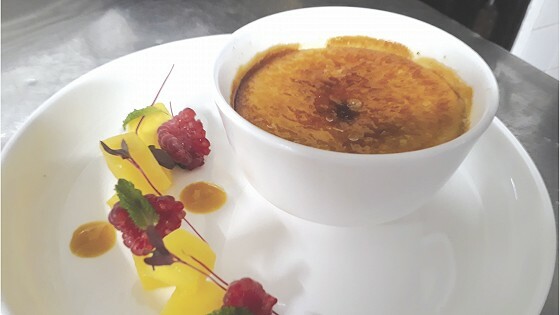 Enjoy our winter menu tastefully compiled by our Head Chef, found in the Arlington Restaurant during winter 2019. Love the sound of this dessert? From the kitchen, Head Chef Shaun Brayley cooks up this Seasonal dish for you to try at home. Serves 2. 1 Pour Cream into a small pan. Place the egg yolks, first measure of sugar into a mixing bowl and beat until the mixture is thick and pale. Using a whisk, pour the hot cream mixture into the egg mixture. Add just a little at first so the mixture doesn’t curdle and whisk gently for 10 seconds. Pour the remainder of the cream in carefully as you continually whisk, pour mixture through a sieve and into a jug to remove the ginger and vanilla pods. Put 4 bowls into steamer then pour custard into bowls, scoop off any surface foam and cling film. Once cooled, put in the fridge and chill for four hours (preferably overnight). Dice mango in a bowl with finely chopped stem ginger, add stem ginger syrup and combine together. Sprinkle each custard evenly with 1 -2 teaspoons of caster sugar and spread it evenly with the back of a teaspoon. Using a blowtorch, one blow at a time, work from the outside to the inside using small circular motions, 1-2 inches from the surface. Let it rest for a minute. Don’t be shy about letting the sugar burn in places as this is how it’s meant to be. Let the caramelised sugar cool and harden to a firm crisp layer (at least 5 minutes). Finally then serve with mango salsa.